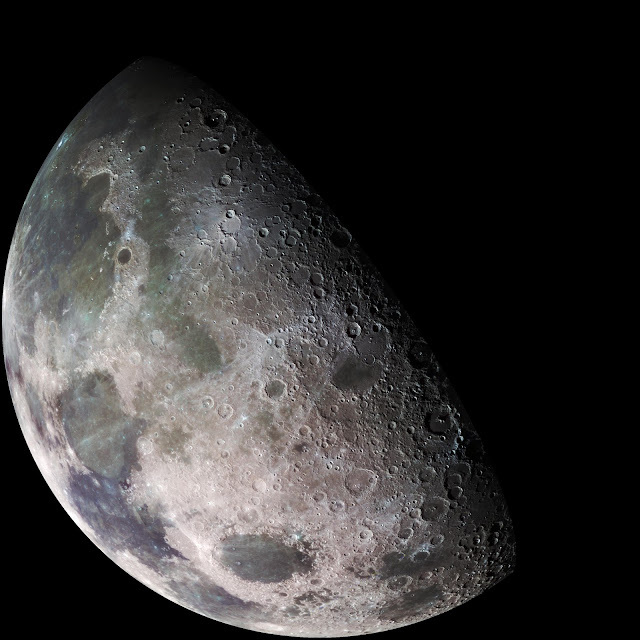 During its flight, the Galileo spacecraft returned images of the Moon. The Galileo spacecraft surveyed the Moon on December 7, 1992, on its way to explore the Jupiter system in 1995-1997. The left part of this north pole view is visible from Earth. This color picture is a mosaic assembled from 18 images taken by Galileo's imaging system through a green filter. The left part of this picture shows the dark, lava-filled Mare Imbrium (upper left); Mare Serenitatis (middle left), Mare Tranquillitatis (lower left), and Mare Crisium, the dark circular feature toward the bottom of the mosaic. Also visible in this view are the dark lava plains of the Marginis and Smythii Basins at the lower right. The Humboldtianum Basin, a 650-kilometer (400-mile) impact structure partly filled with dark volcanic deposits, is seen at the center of the image. The Moon's north pole is located just inside the shadow zone, about a third of the way from the top left of the illuminated region. You're doing a greatjob guys.